On Christmas morning, it snowed. We had the most snow a Portland Christmas has seen for 70 years. We couldn’t believe our eyes when we first saw the snow. 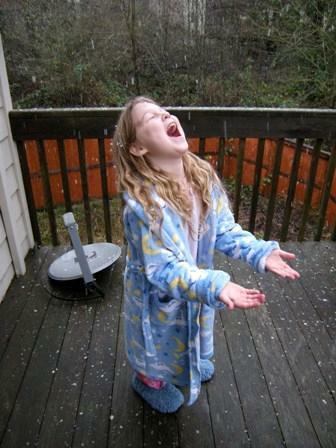 The kids had prayed for snow, but I had very little faith. We gathered by the windows to watch it. And, best of all, it actually stuck. Ilsa made 2 tiny snowmen; the boys had snowball throwing competitions. By this point, they already thrown all the snow off the balcony, so you really can’t see how pretty it was. So, who can guess what I got for Christmas? Best of all, it actually works, focuses, can be downloaded onto my computer, and has a dearth of sand in its sensitive parts. And the goose isn’t the only thing getting fat around here! Well, we are finally on vacation. At last. We decided that yesterday would be our last day, but with one thing and another, we didn’t get around to doing Spanish, so we had to finish it up today. The twins’ faces were a joy to behold when I announced that not only were we doing school during Official Vacation Time, but we were doing it on a Saturday to boot. That was a fun time. “But I wanted to sleep in,“ wailed Ilsa, until I reassured her that we weren’t going to do it first thing. (I wanted to sleep in too) We did the last day’s lesson plus took the test for Units 1 & 2, and then I released the children out into the chill air, rejoicing. We will take 2 sorely-needed weeks before we have to worry about it all again. On Thursday we drove up to Tacoma to get my mother and bring her down to spend Christmas with us. It was interesting to see the standing water along the side of the freeway, and the tidemarks from the recent flooding visible even through the dusk of a winter afternoon. We left 2 hours later than planned, which is pretty typical for us. The problem was that I walked into Ilsa’s room to change the sheets for Mum. She had promised me that it was clean and organized, and it was, but I felt that a small room really doesn’t need an extra 8 boxes full of paper scraps fantastically folded, markers with their lids left off, and scraps of yarn. She was less than thrilled when I went into full cleaning mode. “We just did this,” she informed me. “I know! How could it have gotten so bad so quickly? How long have we lived here anyway?” I agreed, which didn’t help her mood. Today friends stopped by with…some kind of Finnish Christmas bread which is made with cardamom and has cream cheese frosting of some kind on it. It’s superb. Mum brought tubs of chocolates given to her by some visiting group and I put them out in crystal dishes, forgetting what a mistake it is to put chocolate out where it can just be seen and eaten, just one small one, all the time. I’ve made mince pies and coconut pies (note: Americans call these tarts but I’m ½-British and these are mince pies) and I’m making shortbread and fudge and cranberry-orange muffins, just in case. People are coming for tea tomorrow and for a light supper on Monday night, after church. We’re mostly done shopping, although we still haven’t found anything perfect for Mum, and we still need to get things for stockings, and we still don’t actually HAVE stockings. Ilsa has gotten tired of sewing, surprise surprise, and begs for the chance for “fun” sewing rather than the pressing weight of Having to Sew Stockings which hangs round her neck, although some of you may remember that this was her idea. And a visit to their European chocolate section has guaranteed that I will continue to get more and more like that Christmas goose, at least in the near future. We are really having a lot of fun getting ready for Christmas. We are going a little wild on the presents, because we can, because it is so much fun to be in the Lego store and picture Abel’s face opening up something he’s not even dreaming about because he doesn’t think we’ll be able to get it for him, and it’s so much fun to be at Art Media and find the absolutely perfect thing for Ilsa, even though we had already found the absolutely perfect thing for her already at Powells. Plus, with grandparents and aunts not having to worry about international postage, they’re getting thoroughly spoiled this year. And we love it. My last post talked about not forgetting the suffering of others. But I didn’t by any stretch want to imply that might mean we shouldn’t enjoy ourselves, or that there’s anything wrong with the joy of showing our love by giving, or even by receiving. Which reminds me of the twins, blonde heads together, borrowing all my cash to buy me a present at the other end of the store from me the other day. “Mom, can I borrow your credit card, just for a minute?” Abel asked me. The twins together are like a very old couple who’ve been married, been together, forever; the way they constantly bicker but without rancor, constantly disagree. They’ve always done this, and it’s always been really funny. This was no exception. They argued over whether or not to split the purchase evenly, they argued and over-explained themselves to the cashier (who I believe was highly amused; I caught her looking after them), they stood at the front of a long queue of shoppers and said, “No thanks; we’ve already paid,” every time another cashier said, “I can help whoever’s next.” So although I suspect I’m going to be overwhelmed by the brightness of the jewelry they bought me, there is no way I’m not going to treasure it, and not because I’m sentimental–because they are showing me their love by spending their hard-earned money on me. How do we deal with the needs around us? I don’t have any easy answers, especially as I believe it is different for each person. That’s why I told you about the Talibe boys; how hard it was to be able to help them, how I never really did come up with any way except the occasional open carton of milk or handful of tiny tangerines. I don’t know how to deal with extreme poverty; it overwhelms me. But I believe it is good for me to live in a place where I am constantly reminded of my own wealth; where I have to be in that uncomfortable place all the time, dealing with that tension. It’s a good antidote to the shallowness that can afflict us when our main concern is the pretty things at the mall. It starts with awareness, and with gratitude. When we are aware of how privileged we are, then we are prepping ourselves to be able to respond to needs. If our focus is only on what we don’t have, then we are less likely to be able to see others who are hurting, whether they be kids in an Indian sweatshop making clothes for Gap, or the family down the street who have everything and don’t see how empty it ultimately is. On Tuesday, there was a bombing in Algiers, and 17 people died. Closer to home, I read the story of a teenage girl who committed suicide after getting hate mail on a MySpace account, supposedly from a boy, actually from the mother of another teenage girl down the block. We went to the mall to go Christmas shopping and look at all the pretty things. On Tuesday, many people here in Oregon continued to be homeless, flooded out; their wrapped presents and early Christmas trees swept away, pets drowned and cars overwhelmed in the deluge. A late mudslide sent trees crashing into houses and swamped a highway; the photo of it on the cover of the morning paper was amazing. We lit the lights on our tree and played Christmas carols, enjoying the sound of ethereal voices soaring up, up, up on a descant at the end of O Come, All Ye Faithful. It is easy to forget about other’s sufferings. Turn off the television (something we’re always happy to do), only read the funny bloggers and don’t read the Yahoo news, think of happy things. We’ve all got our own grief. My mother’s health is failing, for example. She’s 84 and has Parkinson’s. I’m trying to spend all the time with her that I can, but it isn’t much—there are many logistics that make it difficult. But I can always escape into a book or a movie. No matter where we live in the world, it is easy to close ourselves off from the pain of others. Sometimes this is good. If we are dealing with our own struggles at a time when they are intense, it may be necessary for our mental health. But it can also be a way to absolve ourselves from the responsibility we have for our fellow human beings. In America, it’s really easy to forget. Our roads are paved, our houses are lit. In Africa, it’s a bit harder. I would walk out every morning from my nice house and see a family who lived in a tent; they regularly rang my doorbell and asked me for water. When’s the last time someone who wasn’t just a visiting thirsty friend asked you for water, so necessary for everything we do throughout the day? In America, life is easier. We stress about the things we want—pretty candles for decoration! new holiday-themed cushions for the couch!—but in general, we know that even the homeless on our streets can, if necessary, find a bed and a meal for the night. Our government is involved too; giving money for flood relief and monthly checks to the mentally ill on the streets. We can give money to help shelters, so that we don’t have to worry about giving an addict money for another shot or another drink, and feel absolved from guilt. In Africa, it’s harder to get that feeling. It’s complicated. The intersections are lined with beggars, women in wheelchairs holding up emaciated infants before your horrified eyes, and you know that they are not getting monthly checks from anyone. But you still have to be smart. Those small boys…surely that one is not more than 4 or 5…with huge brown puppy-dog eyes, holding up a red can and telling you they’re hungry, must not be given money—at least not if you know the system. These are Talibe boys, who have been sent by their parents into the care of a local imam; he in turn sends them into the streets to beg. If you give them money or tea or sugar, they take it back to their imam. If you hand them a carton of milk you have just bought for yourself, you must open it first—otherwise they will take it back into the store and get the money for it. The same goes from bananas and oranges. Many boys spend the years of their childhood on the streets of Nouakchott; I’ve heard that those who return with their cans empty at the end of a day may be beaten. And yet there are seemingly thousands of them on the streets on the city, surrounding your car everytime you stop. I’m happy to be in America. I’m happy to have a break from that crushing guilt of wealth—of knowing that we can afford to eat meat every day, of knowing that we may feel stressed about our finances but if we run out of water, we’ll still be able to buy some. Far from there being something wrong with this, there’s something beautiful about being in this situation; it’s a lovely thing to have your needs met. The problem is when we forget that we are in the minority in this world; when we think that the pretty things at the mall are all there is, when our window on the world is blocked by the weight of our possessions. I have hurt my in-laws’ feelings by my post about their cluttered house so I have edited that post to remove it. I want to publicly state again that my in-laws are very generous people, kind to a fault, and that their cluttered house reflects their overflowing and bighearted spirits. I would choose their faults over having in-laws that were critical, parsimonious, or uptight about my parenting or life choices, etc. I love them both dearly, and I deeply regret having hurt them. O Christmas Tree. What an original post title this is. Ok we went a little bit overboard on the tree this year. The tree is smaller than the one in the White House. It is smaller than the one in the middle of the Washington Square Mall. It is, however, a LOT bigger than the ones we got in Mauritania. On Saturday morning, we went out to find it. We were very excited. We went with some friends, who took us to a tree farm. It was an unusual day for Oregon–clear blue sky, sunshine, and really really cold. We bundled up against the wind and set out to find a tree. The first farm was a wee bit disappointing. We wandered through row after row of spindly Noble firs. It was evident that these poor trees had been mutilated–they were obviously larger trees that had been cut down and shaped to about a 6-7 foot height, but their trunks were disproportionately thick, and–worst indignity of all!–a top branch had been bent upwards and tied to fake the tip. I don’t know what they were thinking. Donn and I love noble firs. Douglas firs and even grand firs are cheaper, but in our minds, nobles are the best. And, we may not have TONS of disposable income, but we are thinking of this as our “five-year-tree.” In other words, it’s making up for all those scrawny puny Mauritanian trees, and for all the ones to come. Did I mention it’s a tiny bit big? We left that first tree farm. We knew perfectly well that we were being really picky, and we felt ok with this. Oh sure, people are starving, others are flooded, some people have real problems, but we didn’t care. We drove around a bit in the countryside, and eventually found another place that had mammoth trees, beautifully shaped, truly large and well proportioned. Heaven. And so, somehow, we found ourselves the proud new owners of a…gulp!…ten-foot Noble fir Christmas tree. It’s the prettiest tree I have ever seen. Ilsa, however, rescued us from looking a little too together. Noticing we had no treetop ornament, she fashioned an angel out of tinfoil. 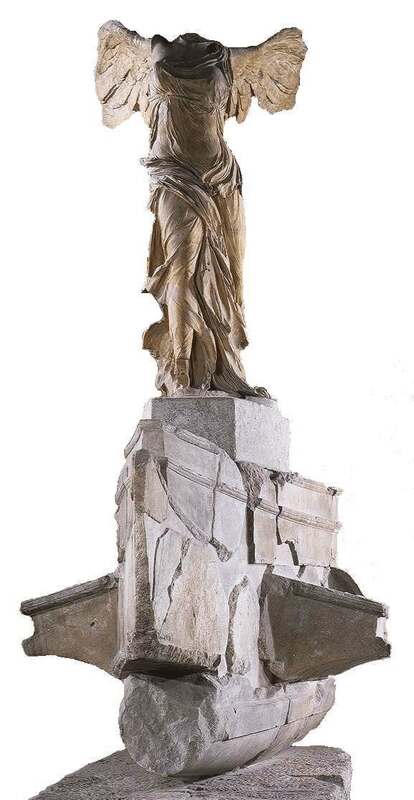 She did a very good job–the look is really that of the Nike of Samothrace, plus the head–except that it is definitely tinfoil, taken from a kitchen drawer. How to reach the top? Donn put the angel on the end of the mop and stood on the arm of the couch while the kids and I laughed and laughed. On Sunday morning, there was frost outside. I woke up the kids, who don’t remember seeing it before. We bundled up and went for a long walk, 45 minutes to church, getting warmer and warmer, finding the building too warm when we finally went inside, flushed bright red from our exertion in the bitingly cold air. Then, wonder of wonders, it started snowing. It rarely snows in Portland; we’re too temperate, too warm, we have ice storms but snow is rare. Snow that actually sticks to the ground is the rarest of all and this was no exception. It snowed off and on for several hours, but didn’t stick. We started off for home through the snow. It was magical; the red berries and pale green lichen adding colour to bare trees, the flakes drifting down, the cries of the children complaining of cold, of sore feet, of tired legs echoing through the still air. We tramped home and collapsed, exhausted, on the couch, proud that we’d walked 1 ½ hours that day. Well, Donn and I were proud. The kids were disbelieving and unimpressed. We have also so far made sugar cookies and a gingerbread house from a kit. I don’t really like sugar cookies. They’re too sweet. I add lemon zest, cinnamon and nutmeg; I mix the icing with lemon juice instead of milk or water. No good. They will still make you sick with gooeyness. But the point isn’t to really eat them. The point is to decorate them, and then give them to others to eat. So it works. My only job is to accept (with no visible show of reluctance ) the ones decorated especially for me, to not show favoritism, to provide dough and cookie cutters and to down several cups of tea or coffee to make them palatable. Also to go on long walks, to counteract the effects of copious amounts of unavoidable sugar. Yes, that is a word. English is a live language, and as such is continually growing and changing. Take it up with the Oxford English Dictionary if you must. Today’s topic was inspired by Veronica, who posted on ways she is a snob. I could relate to her post, but I cringed at her number 5, about people who use foreign expressions when an English one would do. Because that is my life. It’s not my fault. That is to say, nobody forced me to move overseas and have to start trying to think in another language, but I’m not TRYING to be pretentious and impress people. I can’t help it. Sometimes I just can’t think of the English word. Several weeks ago, I was talking to a friend about CNED (the kids’ schooling). “We finally got Elliot’s…uh…etiquettes,” I told her. I couldn’t think of the English word for etiquette. She tried to help me. Behaviour? Etiquette? This made me laugh. The French don’t do stickers. I kept trying, and finally came up with the word “LABELS.” He had gotten his labels, that he puts on the work he sends back. She was very patient and I think realized I was being a dork, rather than a schmuck. But it wasn’t so apparent the night Donn and I celebrated our anniversary several years ago. So when the waiter asked how was everything, I felt compelled to actually tell him. I usually don’t do this sort of thing, but I said, “I’ve noticed how often you’ve told me about other’s reactions to things, and it seems you really want feedback.” Lest I seemed to be setting myself up as some sort of pretentious cheese expert, I explained that we’d just been living in France, where we’d eaten rather a lot of cheese, not to mention pastries. I was trying to add colour, to show, not just tell, like they tell you to. Then it came time to pay. Donn handed the waiter a credit card, then called him back. “Oh I forgot! I just put our plane tickets to Africa on that one–use this one!” Then I think we both blushed. Could we have been any more obnoxious? It’s hard to think how. No, we were schmucks, even though we didn’t mean to be. It doesn’t help that it’s all true, not in a yuppie jet-setting sort of way, just in a normal work overseas sort of way. So yesterday morning, when I was telling Nancy about The Candy Shop in Nouakchott and I said, “And they even have…uh…barbe a papa…what is that?” and Elliot looked up from his work and said, “Cotton candy,” I knew I was being a schmuck. I couldn’t help it. My name is Nomad; I am a schmuck. But what is English for goudron again? No really. But for months, now, I’ve been trying and trying to post reviews with those spiffy little Amazon links. I love those. They look nice, they’re easy for you should you care to check out the books, and, IF you should buy as a result, I get a teeny-tiny percentage to save up for…what else?…more books. But it just WON’T do it! I can’t figure it out! And I showed my computer-whiz sister-in-law, she who actually earns money doing this sort of thing, and she said I was doing it exactly right and she couldn’t figure out why it wasn’t working either! So this whole entire post is just to try to get one to post. I’m planning a list of Christmas gift ideas for you, complete with whining about materialism and rejoicing in good books. So think of this as a preview, not a waste of your time, if you could please. It. Just. Won’t. Work. It’s there, then it disappears and goes grey. Why? My head is about to explode, and we still haven’t done Arabic much less even started Christmas shopping. Ok now I get that little line. Click on it and you get the product. Was that what I wanted? Was promised? Noooo. Ok I can do this… So no spiffy little book pictures for you! Sorry. An unusual chance to actually use my own computer during the day–a power outage! Elliot can’t do his schoolwork as we can’t get online, so I’m snatching a moment to type before the battery dies. The house is dark and cold, except for near the gas fire. It’s not exactly quiet–Abel is asking me a question and Elliot and I are doing Arabic, which requires only the CD player on the computer rather than the internet. Right now, he’s listening to a list of 10 words, deciding where the (hamza) occurs; at the beginning or in the middle. Even though CNED (our French home school/correspondence course) continues to stress and challenge us, I do have to admit it’s very well organized–just what I would expect from the French, actually. The twins are in CM2 this year, which roughly corresponds to Grade 5. I paid 101 euros each (approximately $150) for the entire year, and that includes all their books. For each subject, and there are 8 of them (French, Math, Science, History-Geography, Art, Music, Spanish, and Civic Education), they got a workbook, a teacher’s book which includes corrections, and a folder of exams. Each course has a certain number of units which are further divided into a day’s work, so that each day they will do, for example, Unit 3 day 1. They do anywhere from 1 to 4 pages of exercises, then they correct them. At the end of each unit, they take a test, which is sent to France. A teacher there corrects it, adds comments, and sends it back. They have CD’s for Spanish and French and Music, and they have to take oral exams, record them on audio cassettes, and send them back as well. Elliot’s course is online, but he still has books. He follows the same idea; he does 10 days of work, then takes a test which he sends back. Turn around time is about 2-3 weeks. He can also call or email questions, and there’s an online forum of questions already asked. In Math he’s measuring angles; in Music he’s doing the Romantic period; in History and French they’re studying the Greco-Roman period and he’s reading the Odyssey this year. Their books are full color and attractive, full of little cartoon illustrations, including lines from Asterix. Elliot’s French book is full of art–photos of works of Bernini’s sculptures, Chagall’s and Waterhouse’s paintings, etc. It’s very well done. It also continues to consume hours and hours of my time. Our learning curve continues to be steep. We’ve learned that Abel needs supervision and prodding; left to do his work at his yellow student desk in his own room, he tends to stare at the poster of General Grievous, or watch the rain falling on the street outside, rather than actually work. We’ve moved him downstairs. Ilsa flies through her work so that she can read, but needs to slow down and work more carefully. Elliot is an oldest child who wants to be a history professor; of course he is very motivated, serious, but he gets frustrated because he likes to have a teacher to explain things in detail, and he misses working with his friends. I’m sure their regular teachers already knew this about them; in fact, I already knew this about them, but I’m used to only dealing with it on a level of evening homework, not daily work. We have a deadline in June. If we miss it, we lose the whole year. We started 6 weeks late, and we’ve already made up 2 weeks. Hopefully by Christmas we‘ll be just 2 weeks behind. It’ll mean a busy couple of weeks, and the power outage today didn’t help, but I think we can do it. We’ll get all caught up by the end of February, when French kids get a 2 week vacation we won’t take. Now the power’s back on. It’s been raining nonstop since Saturday afternoon, and there‘s a brand-new baby river at the bottom of our hill. The nearby field has become a swamp. The wind is ferocious, downing trees with weakened roots in the saturated ground. It was a lovely day to stay inside and wonder if we shouldn’t go buy some candles (we didn’t), and then, later, to venture out in hoods and scarves to the local library. We’re set now for a hundred storms, as long as we have light to read by. Except that we have no time! *#@#$ home school!